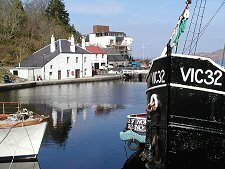 The village of Crinan is rather less well known than the Crinan Canal, which enters the Sound of Jura here. 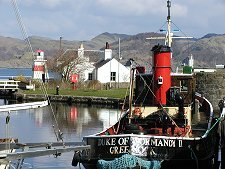 The Crinan Canal took its name from the original small settlement on the east side of the headland, where the Crinan Ferry landed. 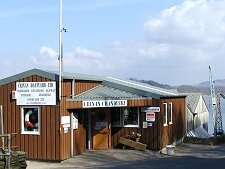 Much of what we today call Crinan was known at the time as Port Righ, The Kings Port and has only come to be known as Crinan since the arrival of the canal. The name itself probably originally comes from the tribe of the Creones, recorded as living in this area on a map drawn in AD140. 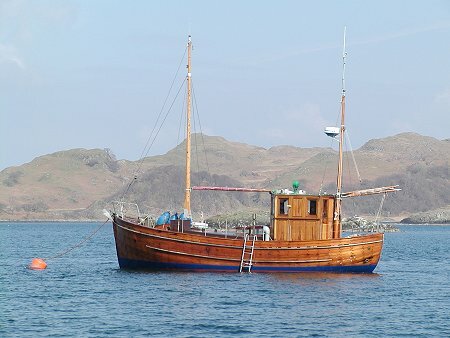 Crinan is usually approached along the road from Lochgilphead, to the east. This closely follows the line of the canal. At Bellanoch, at the head of Loch Crinan, this meets a road coming down from Kilmartin: arrow straight (but very bumpy) as it crosses the Great Moss, the Moine Mhor. 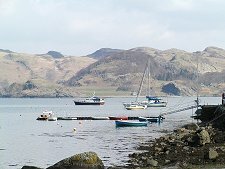 Until 1960, Crinan Bridge on the east side of the headland here was linked by ferry to the appropriately named Crinan Ferry on the north side of the loch. The last couple of miles into Crinan are along narrow single track roads. Close to the village you are faced with a fork in the road. Road signs point you to either the village or the harbour. Following the left hand fork signposted to the harbour brings you to north-west side of the headland on which Crinan stands. Here there is a pier and the sheltered moorings of an impressive collection of craft, all overlooked by a line of cottages. 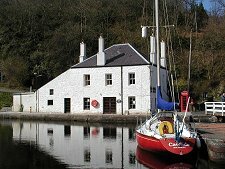 Following the road signed "village" from the fork brings you first to the Crinan Chandlery and Boatyard, and then past the imposing and stunningly sited Crinan Hotel. Every room in the hotel enjoys the wonderful view west to the north end of Jura and the sunsets beyond. 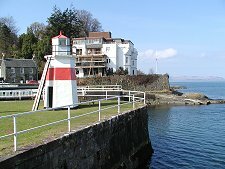 The road ends in a large car park sloping down to the basin that lies close to the point at which the Crinan Canal enters Loch Crinan and so the open sea. 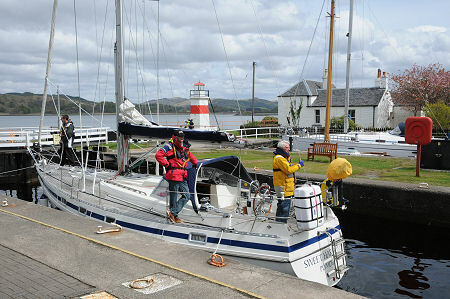 Scotland holds some truly unexpected delights, and the canal basin at Crinan must rate highly amongst them. Here you can wander around a network of paths, lock gates, towpaths and shoreline, simply enjoying the buzz of activity in this stunning location. Much of the activity these days revolves around yachts and other pleasure craft. When we were last there the basin was enlivened by the tug Duke of Normandy II and the old puffer Vic 32, both being restored by enthusiasts. Facing Crinan across Loch Crinan is Duntrune Castle. 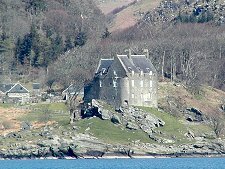 After being besieged in 1644 and burned down in 1685 it eventually passed into the hands of the Malcolm family in 1792. They still own the castle. 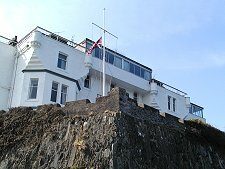 Folklore suggests that it is also still home to the ghost of a piper who was killed by the defenders in 1615 after playing his bagpipes to warn attackers of the castle that they had been discovered.